Louise Washer, president of the Norwalk River Watershed Association and one of the founders of the local Pollinator Pathway initiative, speaks to community members attending the Pollinator Pathway All Partner Meeting. 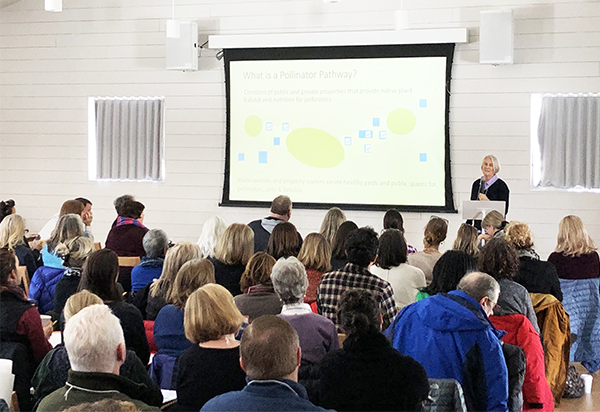 In early March, over 90 community members from the H2H region participated in a Pollinator Pathway All-Town Meeting at Grace Farms in New Canaan, CT. Coordinated by the Pollinator Pathway Steering Committee and H2H, the event featured a talk by Dr. Kimberly Stoner of the CT Agricultural Experiment Station which focused on the science of pollinators and their habitat needs. Exhibitors provided an opportunity for people to learn how to map out Pollinator Pathways in their communities and how to set up a page representing their town on the Pollinator Pathway website, among an array of resources for improving habitat for pollinators and understanding the impact of pesticides. More than two dozen towns in the H2H landscape have joined the Pollinator Pathway program with new towns signing on nearly each week, with organizers in each town adapting the program to their community. The Pollinator Pathway emerged from landowner engagement in activities during the early days of the Hudson to Housatonic (H2H) Regional Conservation Partnership, boosted by a grant from the U.S. Forest Service, Northeastern Area State and Private Forestry program. Read the press release here! Over 40 members of the Hudson to Housatonic Regional Conservation Partnership (H2H) gathered at Pace University on December 12 for the final All-Partner meeting of 2018. Guest Speaker Kate Brandes, Director of the Landscaping for Communities and Wildlife Program at the Lehigh Gap Nature Center, shared lessons learned from a five-year community engagement initiative centered around the installation of 40 native plant gardens in public spaces in Pennsylvania’s Lehigh Valley. Brandes and her partners used these display plantings in prominent locations such as schools, libraries, and businesses to familiarize community members with the aesthetic of native gardens and provide beautiful, approachable models for residential landscaping that supports local ecosystems. The Lehigh Valley case study offered a source of inspiration and comparison with the grassroots Pollinator Pathway outreach underway in the H2H landscape. The meeting continued with working group presentations, breakout discussions on key challenges, and the opportunity for year-end reflection. The Newtown Forest Association, a founding member of H2H, received the National Land Trust Excellence Award from the Land Trust Alliance at Rally 2018: The National Land Conservation Conference, held this year in Pittsburgh, Pennsylvania. The award honors an all-volunteer land trust that has demonstrated outstanding achievement within its community. “I am proud to say that the Newtown Forest Association is fortunate to actually have a piece of wild, open space in nearly everyone’s neighborhood in our community. Our all-volunteer board takes pride in our conservation work and view this as an important lesson to be shared in working together to make these goals a reality,” said Bob Eckenrode, NFA President, in his acceptance remarks at the Rally. Eckenrode cited NFA’s history of collaborating across organizations and boundaries, first through the Fairfield County Regional Conservation Partnership, and today through H2H, as a key feature of their approach to landscape conservation. Click here to read the LTA press release! 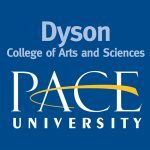 Members of the Hudson to Housatonic Regional Conservation Partnership convened at Pace University for an All-Partner Meeting on December 6th featuring guest speaker Jonathan F.P. Rose, a renowned urban planner, real estate developer, and author. Rose delivered a rousing call to “equalize the landscape of opportunity for all” through planning and design that attends to community needs such as affordable housing, education, healthcare, and open space. A big thank you to Pace University for hosting this event for community members to discuss regional conservation planning efforts! The presentation was followed by working group updates and a review of draft maps showing conservation priorities in urban, suburban and rural areas prepared in support of H2H’s Strategic Conservation Plan. May 2018 – Aspetuck Land Trust: Connoisseur Media interviews Executive Director David Brant (click ahead to 41:15 to hear the interview).